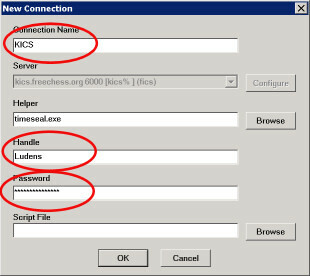 Thief for KICS is a customized version of the Thief interface for KICS, the Kids Internet Chess Server. The latest version is Thief for KICS 1.23. A normal Thief version and Thief for KICS can both be installed on the same computer as long as they are installed into different folders. The installer requires administrator rights. Thief itself runs with normal user rights. If you install it from a normal user (=non-admin) accout you have to do one additional step: move the subfolder THIEFFORKICS from the installing administrator's "My Documents" folder to the user's "My Documents" folder after the installation has completed. Connecting to KICS is very simple. After Download and Installation start Thief for KICS and choose "New Connection" from the "File" Menu. In this dialog field three fields need to be filled out: connection name, handle (your player name on KICS) and password. (If you leave the password field blank you will get prompted for the password upon login). Clicking on "OK" connects you with KICS. To make yourself familiar with KICS the following help files will be very useful: help intro_general, help intro_basics, help intro_talking and help intro_playing. You can also read these and all other helpfiles when logged on to KICS, just type eg "help intro_playing" into the main console (without quotation marks). Good luck with your games and see you on KICS!